Metropolis is my first experience with Anime, the Japanese animation that has taken comic strip sensibilities to new artistic frontiers, I can't view Metropolis by comparing it to others of the genre. For me, the animation, in it's staccato delivery, was all right, but it surely did not blow me away. In fact, it looked very much like an animated comic strip, which I suppose is appropriate. The biggest difference is the approach to the material. It's composed with cinematic sensibilities, much like the best of Pixar and Dreamworks' newest animation incarnations. There are pans and cuts, more likely in a standard feature film, that punctuate and move the action along. Taking Metropolis on its own terms, if I had to liken it to any films of the past, it's most closely related with the B serials of yesteryear. Flash Gordon comes to mind. Some of the future concepts could has slipped through the cracks at a Buck Rogers art conference. Certainly, the parallels of films past make interesting fodder for cinema studies. The jumping off point from Fritz Lang's classic silent scifi film Metropolis works very well. 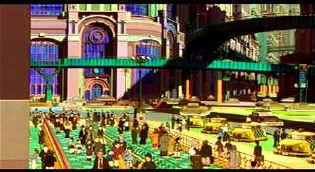 Much of the look is inspired by the sets of the silent classic and the robot creation Tima, the ultimate symbol of Lang's great film, is the central mystery and power of this animated Metropolis. There are robot detectives reminiscent of Blade Runner and a romance between a human and an advanced humanoid robot as in that film. Metropolis is yet another tale of the quest for absolute power, but it is twisted through the circuits of a robot worker society. As the city celebrates the completion of the Ziggurat, a futuristic tower rising high into the rafters of the city, Shinsaku Ban, a private investigator from Japan and his nephew Kenichi have arrived in Metropolis to on a tip that renegade scientist Doctor Laughton is hiding out and secretly working working in Metropolis. The elected government is seemingly in control, but other powers are at work. Duke Red who has commissioned the building of the Ziggurat, a powerful computer control center supposedly designed to make life better. Duke Red controls a somewhat undefined quasi street force run by his adopted son Rock. An underground band of dissidents is fermenting rebellion. Motivations of the bad guys are not crystal clear. Metropolis does supply an edgy short circuit or two that goes way past what I would have expected from the material. There's even a touch of romance as Kenichi and his uncle discover Tima, Laughton's creation, and when she is left abandoned, Kenichi makes a connection with her. It's Kenichi's bond with Tima that fuels much of the action as Rock hunts furiously to eliminate them before Duke Red brings Tima to her ultimate destiny. Based on the late 1940s Japanese comic strip from Osamu Tezuko, this visualization of the future is brought to animated life by acclaimed director Rintaro. The director gets the action moving at a swift pace. The script is mostly action movie with very little humor. One inspired moment is the robot fire department sequence put together like a synchronized dance number left over from a Busby Berkeley musical. Violence is pretty cheap in this Metropolis, but blood seems absent from artist's palette. The interesting moody music that accompanies the film is a huge asset, especially in the chase sequences as Kenichi and Tima try to avoid the murderous pursuit of Rock. The storytelling elements are very comic strip in their simplistic manipulations and characterizations, in synch with the material and genre. The visual style is fairly crude, like a comic strip brought to stop-action life. It lacks the visual splendor of some of the best of recent animations. The more shadowy sequences are drawn with fine visual sensibilities. Even narrative style could be considered choppy, much like the animation here and certainly keeping beat with the staccato rhythms of comic books. I was expecting more from this transfer of Metropolis. It's good enough, but there are aspects less than acceptable. There are lots of motion artifacts on the cityscape pan at the beginning of chapter 4, appearing almost like composite source material, which was visually obvious and disturbing. Black levels are good and shadow detail works very well. Some of the scenes are somewhat soft and color bleeding is subtly evident. The Dolby Digital 5:1 sound has wonder spatial design with fine directionality and openness. Delivered by Columbia in a special edition, most of the supplemental materials are contained on an included minidisc. There's a documentary, The Making of Metropolis, animation comparisons, filmmaker interviews, with English subtitles, a written history of Metropolis, and a photo gallery. Will Metropolis seduce me into the world of Anime? I doubt it. It's entertaining, but it's no Shrek or Toy Story for my money. Yes, I am glad to have experienced the much ballyhooed animation genre and I enjoyed Metropolis enough.